Easter holidays brought us many strong climbers from everywhere, many hard redpoints & onsights, as well as some strange weather ranging from spring sun to sudden snow and strong wind. Climbers were all around and hard ticks were noticed in almost all the crags of Istria. 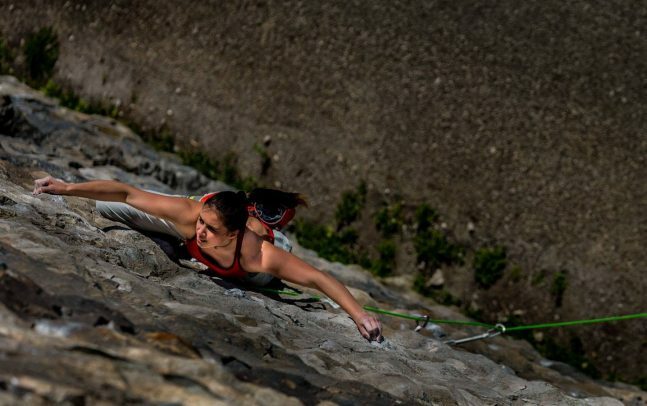 In Italy, in Napoleonica, young and strong competition climber Eva Scroccaro bags first female ascent of Orcobaleno, 8b in a sector above the road. Costiera was visited by WC boulder vice champion Jernej Kruder, who had fun while onsighting Cocomo, the short and artificial 8a and “nice and easy” Kura 7c+, he also climbed on his 2nd go slabby 8a+, Doris. In Slovenia: Osp, Mišja peč and Črni kal were overcrowded at the moment with people from everywhere. Uroš Brecelj made a good choice and visited Lijak near Nova Gorica where he flashed nice but rarely repeated 8a Venezia. Bravo Uroš for his first 8a flash ever! In Croatian Istria young Jani Zoraj quickly climbed Naytiri, steep 8a of Pandora. Strong Gašper Pintar visited new, still secret sector of Istarske toplice, where he onsighted the classic American gipsy. Andrea Polo’s route was already done by Sbissi, Carlo Giuliberti, Gogo,… and they all considered it as an 8b. Strong Pinti couldn’t claim his first 8b onsight, but rather downgraded the route to 8a+. Besides that, on the same day he also send beautiful tufa climb called Champs Elysees (8a+) on his 2nd attempt. Carlo Giuliberti was climbing in secret Medveja where he in 2ng go crushed Happy birthday (8b) and later redpointed long and beautiful Štrnoflc (8b+) as well. There was also a kind of an inccident in Buzetski kanjon where policemen caught some climbers sleeping in a parking place during the night. They were all forced to leave and pay a fine. Not a good option for camping in the future. Check the accomodation around, it’s everywhere, it’s friendy and it’s cheap!